In the year 2036, scientists have perfected the science of time travel, and send a man [named Dean West] back to the 1950's as a test. However, the man becomes obsessed with President John F. Kennedy, and sets out to save the president from assassination. Time travel is perfected in the year 2036. Following tests, and fearing that others may be close to perfecting similar technology, the U.S. government of the day send a man named Dean West to the year 1954. When messages sent to West from the future are destroyed in transit, his own fears drive him to paranoia, and he breaks off all contact with 2036. The government of 2036 then send a second man [named Dwain Jackson] to the past to neutralize the threat posed by the loose cannon, Dean West. Dean West then comes to idolize President John F. Kennedy, and decides to use his knowledge of history to save the president from assassination. Dean West attempts to save Kennedy, and is then thrust into the midst of the rogue plot to assassinate the president. This novel's plot allows you, the reader, to take a new look at the events of 1963 through the eyes of fictional characters. It combines many twists and secrets, and incidentally explains the hidden "truths" behind the deaths of Maralyn Monroe, Bobby Kennedy and officer J.D. Tippet, as well as touching on the Watergate scandal. 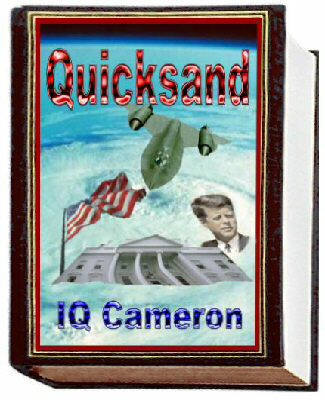 Quicksand combines the intrigue of conspiracy, the question of "who shot JFK?" and the paradoxes of time travel, all of which are subjects close to the American people's heart, and in fact, most people. Wait until you see what Dean West does to prevent Kennedy's assassination! You won't believe the outcome! Compelling and utterly provoking. You won't be able to put this one away until you've read the amazing conclusion! All were silent for some time... In the absence of evidence, there was nothing to gauge success upon, except for the fact that Phoebe was no longer within the building. Fredericks, however, was very positive. In his mind, TEGAN was a success. "Well, Will, I mean, Mister President," he blurted, shaking Forrest's hand vigorously. "If you'll pardon the pun, Sir, I believe that we just made history." ...Tegan proved accurate. Dean West was drugged unconscious for his radiation treatment, the computer settings were checked, and at 1:32:18 AM, there was a single and powerful pulse of light emitted from the top of the US-TECH building. Tegan then reported to a group of men and women who sweated in feverish anticipation that Dean West was no longer in the building. The man was clearly waiting for someone. West could not see his face, but from his build alone he could tell that it most certainly was not James Hardy. Hardy was taller and not as heavy. Yet the build of this man looked strangely familiar... West felt the hair on the back of his neck stand on end as a member of staff approached the man to speak with him. As the visitor turned to face the staff member, West could clearly see him. A bomb exploded inside West's head as Dwain Jackson's face became clearly visible. The name may have changed, Jackson thought, but the face was now quite recognizable. The moment was surreal, almost amusing. Then slowly it became annoying. Why had Jackson never seen it before? How could he have missed it? Anger rose within him as he viewed his visitor. The truth had been there all the time, and he had never seen it. Standing before Jackson, calm and composed and in no hurry, the younger man simply stared back. He was not aggressive or brutal. In fact, he seemed rather pleasant. It was not the face of Dean West staring back, although this man looked entirely like him. The resemblance was astonishing! Nor was it the face of Alek Hidell - whoever he was. Lee Harvey Oswald seemed completely unmoved by Dwain Jackson's presence. President John F. Kennedy was safe. "We always said that we were prepared to take control of the fate of the United States by open force if it came to it. We can't back out now! Kennedy will be here any minute. Hide ????? 's body. I'll tell you what we're going to do." He raised his left hand to the window and pressed it flat against the glass when he saw the presidential limousine pass by. The vehicle was moving very slowly as it passed along Elm Street past the Schoolbook Depository Building. They were traveling at little more than a crawl now, and even that fact struck West as strange. Thetardy pace of the motorcade added to the dazed perception that he was viewing this monumental moment of history in slow motion. President Kennedy rubbed his brow again, neatening his fringe. The people were cheering, waving. The driver saw West fall to the ground, and he leapt from the car to secure him. There was no need... Before he could even see West, his partner was already on the scene, panting and very angry at having to run after his prey. West watched fearfully as the gasping man approached, fists clenched. He was breathless and terrified. This man would tear him apart. "Just one thing, West - where the hell did you get your information from? How did you know Oswald was up to something?" West raised his eyes and smiled painfully at Harvey. "It's a long story, Sir. It's a very, very long story. But if you hang around, I'm almost ready to tell it." "Computers have now confirmed what we already suspected, Sir. The latest change to records gives us some of the details of Oswald's presidential pardon. Oswald was... secretly freed and given a new identity after due process of law..."
"No official reason given. Whatever the reasons, Sir, this was cooked up at the very top, and purposely kept quiet - until now, anyway. It was top secret in its day." "No Sir. Just the pardon. We'll keep you posted, Mister President." Immediately the image vanished. The interest that the message conjured up though, did not. Purchase the thrilling conclusion to Quicksand.